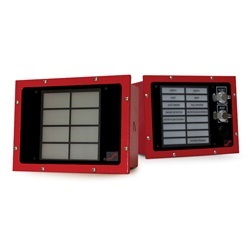 The M08/M16 Mini Annunciators are designed for a variety of fire and security applications and offers versatility with a compact design for displaying the condition of a monitored device. These Mini Annunciators feature a red or black textured finish, indoor or outdoor style enclosure and flush or surface mounting. The display features a removable legend and is accompanied by a variety of circuit options and switch configurations to meet your design applications. Zone nomenclature is easily changed on the removable legend sheet before or after installation.